Every bride has her own personal taste, with the variety amongst this bunch, there is something for everyone. I created this pastel color necklace “Grace” for bohemian bride- free spirited woman, inspired by the world around her. Jewelry design © Ezartesa. Buy Now! For this beautiful, simple but very special, one-of-a-kind bridal necklace I used Blue Lace Agate cabochon as a base, and embellished it with rose alabaster satin Swarovski crystals, and violet Oyster Shell Heishi beads. 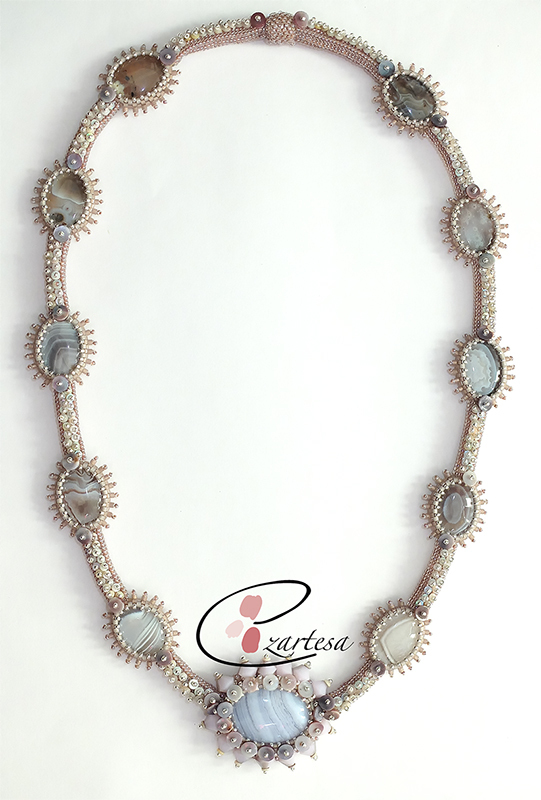 This hand beaded necklace has lilac, taupe, silver plated glass seed beads, Botswana Agate beads, grey, light green Oyster Shell Heishi beads, and magnetic clasp (easy to put it on, and put it of). I used and followed the principles of rhythm, harmony, balance, scale and proportion, a great use of color and texture. I call this stunning pastel color necklace “Grace” because Blue Lace Agate stone commonly believed to calm the mind, enhance grace and increase lightheartedness. 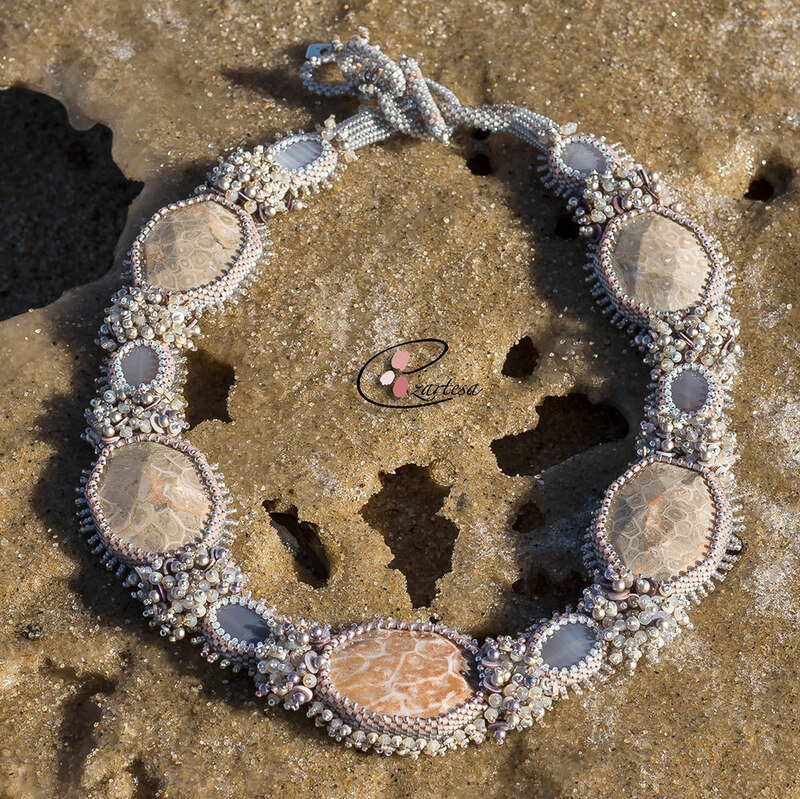 A soft blue, pink, purple, and light green color flashes of Oyster Shell Heishi beads makes this necklace perfect for summer beach wedding. I’m so exited about my 2015 Beach Wedding seed bead jewelry collection. This one-of-a-kind “Sunset Blues” bridal necklace I hand beaded from the best quality tiny Japanese glass seed beads. I used natural blue Chalcedony, Botswana Agate cabochon, and gemstone beads, powder almond, mauve Swarovski crystal pearls, and air blue opal crystals. 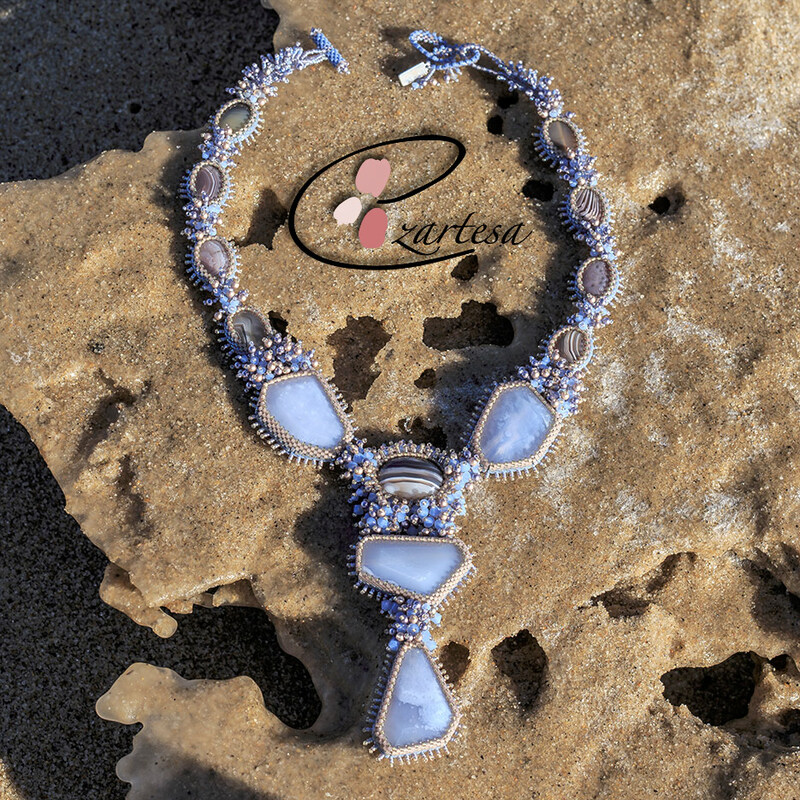 The gorgeous blue-lavender color of this necklace would add an interesting dimension to other colors of your wardrobe like toasted almond, sand stone, mauve and dusk blue. 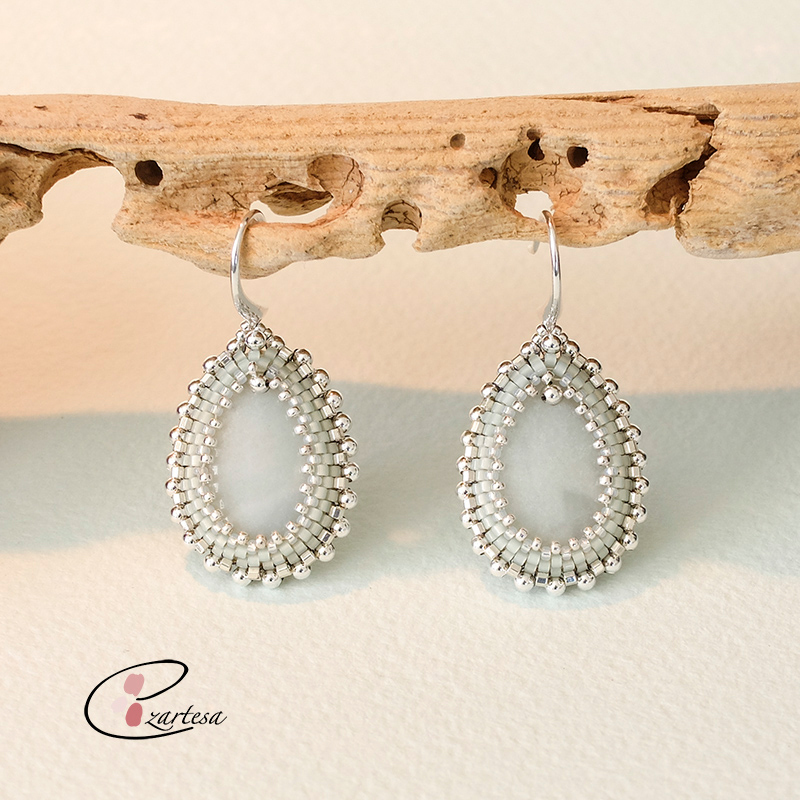 Hours of intricate beadwork, stitched one bead at a time around the large blue Chalcedony faceted stones. This adjustable statement necklace is dramatic and bold, but lightweight, and won’t weigh you down. My necklace “Sandy Shore” is earthy, and close to nature. Main colors of this necklace caramel, toasted almond and taupe are a beautiful neutrals to embrace, and works well with so many colors on the spectrum wheel. 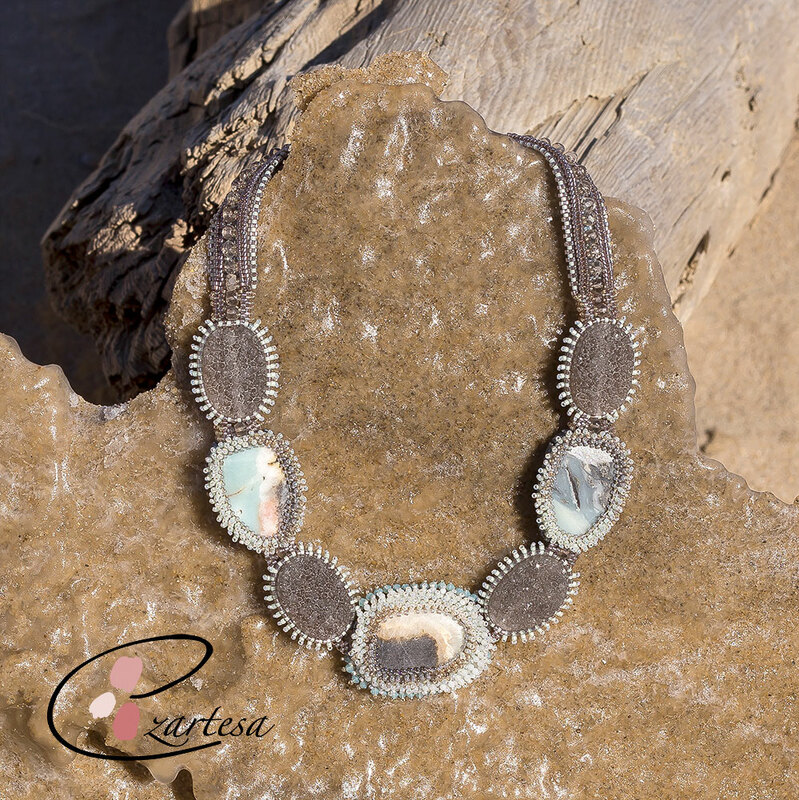 For this beautiful necklace I used Fossil Coral- gorgeous stone with ornate starburst and millefiori like patterns. It is petrified coral with no artificial enhancement. I used Botswana Agate beads, Swarovski mauve, platinum pearls, sand opal, grey opal crystals, and violet, grey Oyster Shell Heishi beads. This artsy and stylish necklace I hand beaded from tiny Japanese Glass seed beads (mint green, smoke, blue grey). I used Natural Brown Agate Druzy, Amazonite with black Tourmaline big faceted flat rectangles, and embellished with natural Amazonite beads and Swarovski pacific opal crystals. Amazonite Teardrop Earrings are made using sea green, and silver plated tiny Japanese glass seed beads, silver plated brass beads and silver plated earwires. Earrings are 1, 5” (42mm) long. 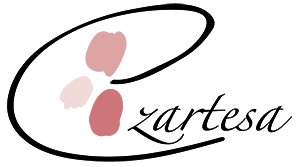 They are not heavy, and look good with everything: simple t-shirts, dresses. Dress this up or dress it down-either way you’ll look amazing.